This article is about the hardware device. For the fortune-telling practice using a deck of cards, see Cartomancy. A memory card reader is a device used for communication with a smart card or a memory card. A magnetic card reader is a device used to read magnetic stripe cards, such as credit cards. 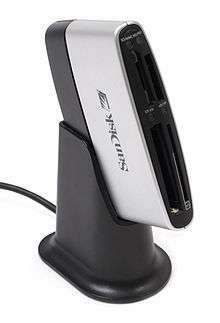 A business card reader is a device used to scan and electronically save printed business cards. See also: Contact smart card and Contactless smart card. Some keyboards have a built-in card reader. External devices and internal drive bay card reader devices exist for personal computers (PC). Some laptop models contain a built-in smart card reader and/or utilize flash upgradeable firmware. T=1 Asynchronous half-duplex block-level transmission protocol, defined in ISO/IEC 7816-3. T=2 Reserved for future use. T=3 Reserved for future use. Contactless APDU transmission via contactless interface ISO/IEC 14443. If the card does not use any standard transmission protocol, but uses a custom/proprietary protocol, it has the communication protocol designation T=14. The latest PC/SC CCID specifications define a new smart card framework. This framework works with USB devices with the specific device class 0x0B. Readers with this class do not need device drivers when used with PC/SC-compliant operating systems, because the operating system supplies the driver by default. PKCS#11 is an API designed to be platform-independent, defining a generic interface to cryptographic tokens such as smart cards. This allows applications to work without knowledge of the reader details. A memory card reader is a device, typically having a USB interface, for accessing the data on a memory card such as a CompactFlash (CF), Secure Digital (SD) or MultiMediaCard (MMC). Most card readers also offer write capability, and together with the card, this can function as a pen drive. Access control card readers are used in physical security systems to read a credential that allows access through access control points, typically a locked door. An access control reader can be a magnetic stripe reader, a bar code reader, a proximity reader, a smart card reader, or a biometric reader. In the 1-to-1 mode a user must first either presenting an ID card or enter a PIN. The reader then looks up the template of the corresponding user in the database and compares it with the live scan. The 1-to-1 method is considered more secure and is generally faster as the reader needs to perform only one comparison. Most 1-to-1 biometric readers are "dual-technology" readers: they either have a built-in proximity, smart card or keypad reader, or they have an input for connecting an external card reader. Proximity card readers are still referred to as "Wiegand output readers", but no longer use the Wiegand effect. Proximity technology retains the Wiegand upstream data so that the new readers are compatible with old systems. 1/12/12/1 gives a facility code limit of 4095 and 4095 card number. Wiegand was also stretched to 34 bits, 56 bits and many others. Smartcard readers have been targeted successfully by criminals in what is termed a supply chain attack, in which the readers are tampered with during manufacture or in the supply chain before delivery. The rogue devices capture customers' card details before transmitting them to criminals. Chip Authentication Program (CAP) uses EMV banking cards to authenticate online transactions as a phishing countermeasure. Geldkarte is a German electronic purse scheme where card readers are used to allow the card holder to verify the amount of money stored on the card and the details of the last few transactions. Wikimedia Commons has media related to Card readers. ↑ "Mobile Credit Card Readers Grow with IOS as Foundation". Macworld.com. Retrieved March 22, 2012. ↑ "Bar Code Basics". Online Conveyor Parts. Archived from the original on January 16, 2012. Retrieved March 22, 2012. ↑ Henry Samuel (2008-10-10). "Chip and pin scam 'has netted millions from British shoppers'". The Telegraph. Retrieved 2008-10-13.